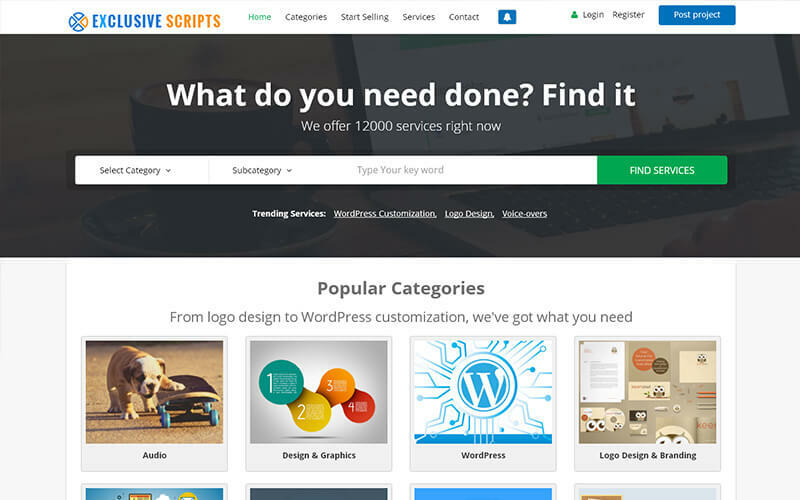 We have developed a new script that mimics the features and functionalities of Fiverr. This it Fiverr Clone script allows your visitors to post jobs that they want to get it done by the job seekers. It is one of the best micro jobs script in the marketplace right now. This script is developed with a responsive design which suits almost all the devices be it mobile phones, laptops or iPads. With the user-friendly navigation users can access the website with easy and find out what they need in a hassle-free manner. Some of the features that highlight our script in the industry are PayPal payment integration, supports multiple currencies, with unlimited number of categories and sub-categories which craves for more users for the website. This script is capable of running effortlessly with 10 million user databases. Our Fiverr clone php script is user-friendly which makes it easy to run the website without much of a technical knowledge. We understand that getting your website to reach the customers, micro job seekers and freelancers is necessary. Hence, we have developed our script with SEO-friendly structure and it is optimized in accordance with Google standards which makes the website come on top of the search results from search engines. You don’t have to worry about the visibility and scalability of your business. We have integrated this script with several revenue models such as banner advertisements, Membership fees, Google AdSense, commission for each project that can be set by the admin. We have also added several features that we considered to be necessary and would make the users more convenient which are e-mail notifications, social media login and sharing, IP blocking, secure coding, Google-friendly architecture are to name a few. I like this Fiverr Clone Script. It is capable of holding the visitors job info and the visibility looks quiet good. Over all mind-blowing script. Usage of this script makes me more profitable than I expect and user-friendly. Technical support team works hard that satisfies me high.